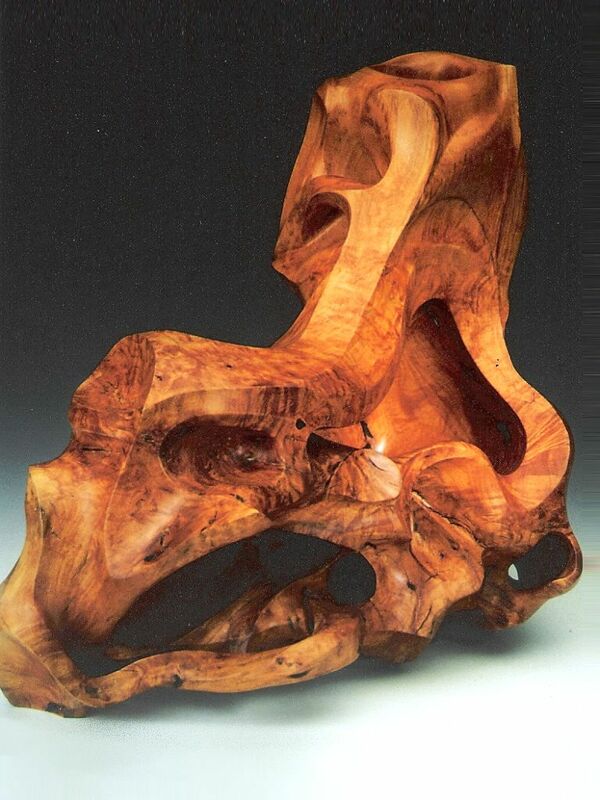 his burl wood sculpture “announced” its name to me before I ever began working on it. It’s natural deep penetrations and shelves reminded me of the dwellings created by the Anasazi Indians of the American Southwest. It was my job to do abstract justice to the concept. The apple stump burl from which I sculpted Cliff Dwelling came from a pile of waste wood that was scheduled to be burned the following day! But I rescued it. Timing is everything — and I guess my timing has often been “in the nick of” since many of my natural sculptures are the result of such “rescues.”‘ In this case, the site was near Asheboro, NC, where the property owner was reclaiming a derelict apple orchard. On a personal note, Cliff Dwelling occupies a special place in my own private collection. I’ve kept it because, while deep in thought sculpting this piece, I was struck with the realization that I had to propose to Gaye…and she said “Yes”!